It’s something I’ve wanted to do for decades and I finally did it. I wanted to ride the California Zephyr to, where else, California. I’m still in California. 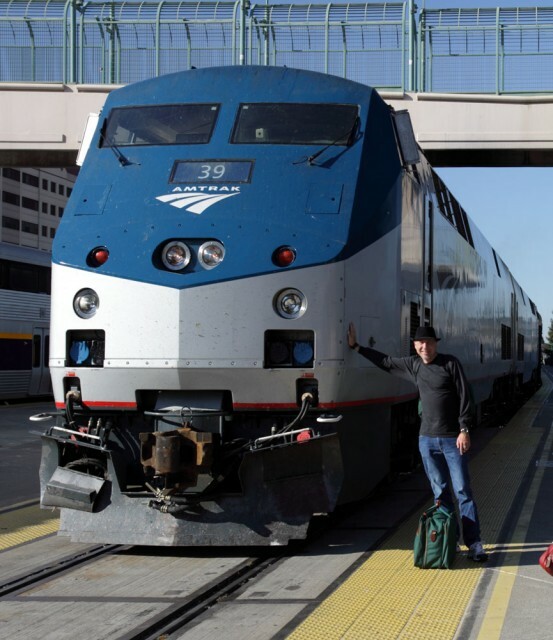 In a matter of days, I’ll be returning via the Southwest Chief. Equivalent to 4200 horses, Amtrak 39 delivers me to Emeryville near San Francisco. Who is that handsome devil by the choo-choo train ;p? I hope it’s been fun and look forward to hearing tales of your travels. I have no idea who’s up by the choo choo train. Probably a passenger who drove 2 hours to Denver, then rode the train 2 hours back, passing within a few miles of where he started. Why the train couldn’t make a special stop for him, I’ll never know. So you slept in a sleeping car and the whole deal? I’ve done Amtrak on a day trip but never overnight. I know some people just sleep in their seats while others get the little sleeper cabins. I did the whole deal! 🙂 There was even a sleeping car attendant named Jason. Now I know what your real job is. That station looks familiar. Have I been there before? LOL!